Here's the card I made with it. I started by stamping the wreath from PTI's Twig Wreath stamp set onto my background in classic kraft ink. You have until Thursday, July 7th to link up your card. The second I saw the sketch I knew you would make an incredible card. Gorgeous, Leigh! Congratulations on your ig followers, I am one of them! Such a pretty card today. Such a beautiful card!! Congrats on your stats!!! Your blooms are so pretty! Soft and gorgeous! Mega Congrats on your 1000 Followers! Yahoo on your instagram account! Love this beauty. I just got those WPlus9 stamps today...will have to have a play this weekend. Gorgeous card! 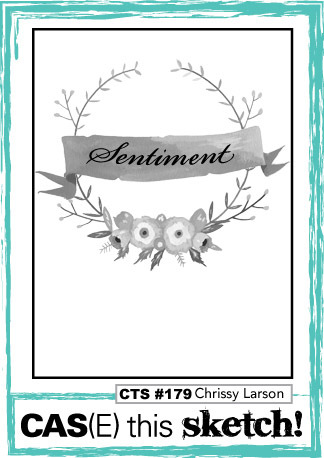 Love the wreath and flowers, and love that sentiment! And congrats on your IG followers! SO fun! Applauding the milestone on your instagram! If I had a 'clue' (translation: I don't know how to edit photos on my teensy iPhone and I'm simply just not that tech literate...pathetic! ), I'd start adding photos there...a summer 'learning' project. Your wreath...gorgeous and spirit-lifting.